We went down to the mouth of the River Exe yesterday, and sat for a while having a thoroughly lovely time. I was painting and thankfully T remembered I had left the book on the roof drying, before we drove off. Unlike B – who forgot until we were halfway home, Now who is the brain-injured one here !!! sorry the pictures are not good. When I have a moment this week I am going to photograph them properly. 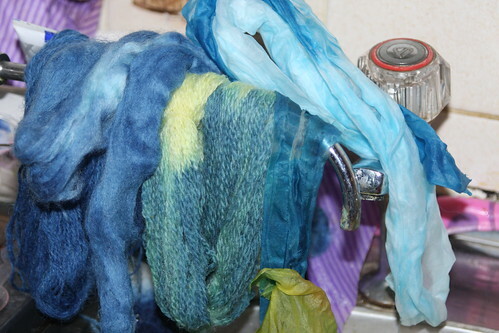 There are clouds and clouds of cerulean skies (fourth dye bath), cobalt and …. as I went off to look for the painterly names I came across this excellent website Colour Selection – Blue, which gives all kinds of meanings. I shall use this as a bit of a prompt to write something I think. I also did some sketching at the time – very loose use of watercolours, pastels and acrylic.. which threw up some ideas for how I could use these blues and the wool in a tapestry – linear form. 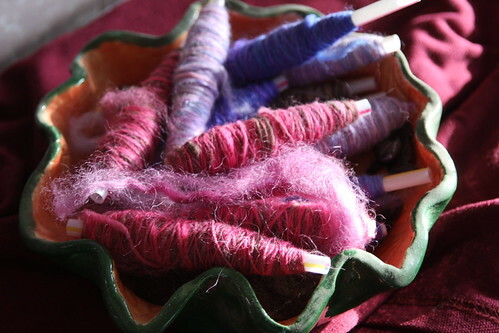 I love the idea of spinning some wool and then stitching over it – perhaps the birds? 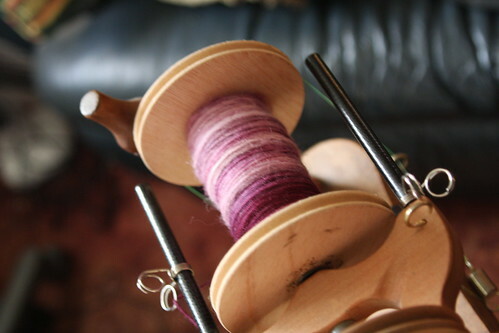 The Fiber Binder Club – first sample is sat in my bag waiting to be spun. I am taking it with me this afternoon when I go over to Brockweir for the Craft session they hold on a Monday. This photo does not do it justice. The binder was of high quality, the inserts were of excellent quality with three lots of the sample. One unwashed, second washed and the third prepared ready for spinning. As I had it to hand, I dipped a little of it in the Indigo pot.. nom, nom…. 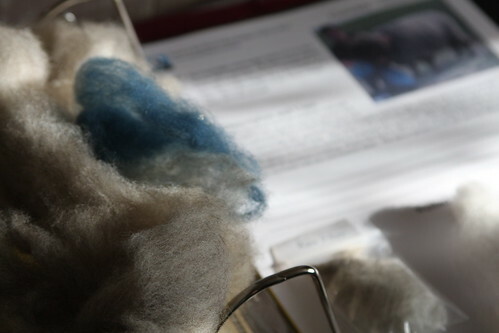 I am hoping at a later date to do the Guild of SDW certificate of achievement, so by working through these fibres now, I can see what I like and why, also why I don’t and why… a bit of a challenge. 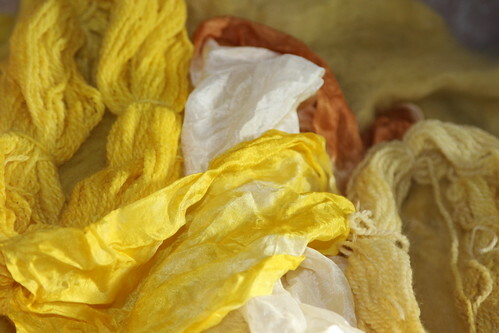 WoofnWooly – a very dear friend of mine, introduced me to the wonders and dyeversity of natural fibres and reminded me that fleeces are amazing, during my time with the SpinDyeWeavers. I am afraid I had got rather lazy using prepared rovings – time was all then. Nowadays though there is not a time that I touch some fluff, or pause and smell some hedgerows when I don’t think of him..
At the silk samples I have floating around the house. These are Persian Berries, cutch (the brown at the back) and goldenrod.